Can you use GH1 Hack/Settings with GH2 Camera ? Any reason to use them? Normally it is pointless, as patches are different, because encoders are different, and GH2 settings are better. ok,I just got a good thing going with my GH1 and bought a gh2,now Im having trouble getting that same quality or better..well I can see the difference but getting grain issues,I love shooting at 24p because I try to get that old school 70,80,s feel.. but Im new to this tech stuff and want to get a really great quality but shoot at 24p with out grain,till I add it. I hope this makes sense ???? Hacked GH1 is a great camera, if you get a good copy much less noise than the GH2. A lot of the GH2 owners have never owned the GH1, so don't have an understanding of how good it was/is with settings like LPowells reliable settings. I use Two GH13's as my main income producing cams, the GH2 is just for some beauty shots and interviews with on board audio now we have Per's excellent audio patch made possible by VK. Rambo is right. The right GH1 is much less noisier then the noise the GH2 produces. I have both and several versions of GH2 cams over the last 18 month that can't keep up to my patch I use on my GH1. To me the GH2 with live HDMI, audio meters and ETC are not always worth the difference. Perhaps someday it will catch up but the sensor produces more noise then a GH1, some however love the look which is cool. thanks guys,so what patch are you using for 24p vintage style for the gh2 ??? if so please let me know the name and link if possible. @Shishboombah Only you can define " vintage", start by looking in all the patch threads and watch some videos of samples. @Rambo May 7 .... ......also what you may or may not know, GH1 ISO selection settings are different than GH2. GH1 at 160 is equivalent to GH2 at 100....isnt it opposite ? 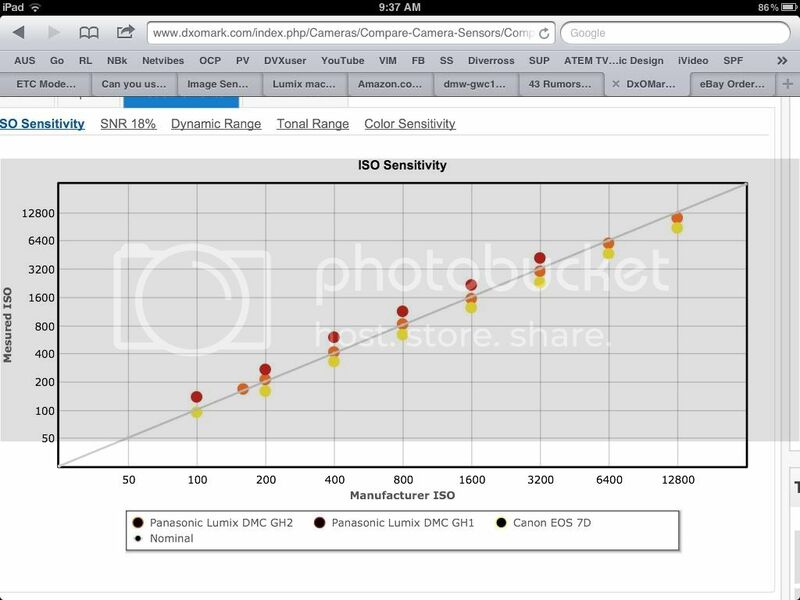 ....there is no ISO 100 on GH2. It starts with 160 ISO . I used to use @lpowell 's GH1 Max Lat Anamorphic settings with my LA7200 adapter on my GH2. It was useful for learning 2.35:1 skills, since the GH2's viewfinder showed the frame unsqueezed. This was under firmware 1.0. I haven't tried it under 1.1, nor whether the video files it produced were particularly useful.